I'm amazed by 7-Eleven's recent moves to turn about a dozen of their stores into Kwik-E-Marts. They're going to even sell Simpson's related-products, like Krusty-Os, and Squishees and Buzz Cola. 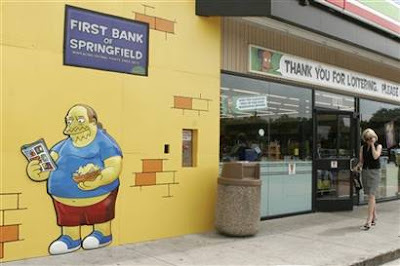 They've decorated the outsides of the stores to make them look just like Kwik-E-Marts as part of a promotion for the upcoming Simpsons Movie. The amazing part is not that someone thought of the tie-in. That's a no brainer in this case. What's amazing is that they're laughing at themselves. What's amazing is that they're willing to cover up their brand temporarily. What's amazing is the fact that Apu is a stereotype didn't stop them from doing it. After decades of carefully packaging messages, the companies that are going to thrive in a Web 2.0 world are the ones that can be real. 7-Eleven is going to get a lot of benefit from this promotion. It's a great way to increase the value of the brand, don't you think?